This set of Cyber Security Problems focuses on “Types of Cryptography – 2”. 1. _____________________ is the art & science of cracking the cipher-text without knowing the key. Explanation: Cryptanalysis is the art & science of cracking the cipher-text without knowing the key. This technique is also implemented for designing new cryptographic algorithms or to test their strengths. Explanation: Cryptography is a means of storing & transmitting information in a specific format so that only those for whom it is planned can understand or process it. The process of disguising plaintext in such a way that its substance gets hidden (into what is known as cipher-text) is called encryption. Explanation: Cryptography helps in securing a specific format so that only intended users can understand or process it. The method of reversing the encrypted text which is known as cipher text to its original form i.e. plain text is known as decryption. 4. Which of the following is not the primary objective of cryptography? Explanation: The key intent of implementing cryptography is to offer the following 4 fundamental information security features. These are Confidentiality, Data Integrity, Authentication and non-repudiation. 5. Which of the following is not the primary objective of cryptography? Explanation: Cryptography offers 4 fundamental information security features. These are Confidentiality, Data Integrity, Authentication and non-repudiation. 6. Cryptography offers a set of required security services. Which of the following is not among that 4 required security services? Explanation: There are 4 desired & necessary security services are encryption, Message Authentication Codes (MAC), digital signatures and hash functions. These help in securing the transmission of data. Explanation: Cryptography is a means of storing & transmitting information in a specific format so that only those for whom it is planned can understand or process it. Cryptosystem which is also known as a cipher system is execution of cryptographic algorithms & techniques. 8. ______________ is the mathematical procedure or algorithm which produces a cipher-text for any specified plaintext. Explanation: Encryption Algorithm is the mathematical procedure or algorithm which produces a cipher-text for any specified plaintext. Inputs it takes are the plain text and the key. 9. _______________ takes the plain text and the key as input for creating cipher-text. 10. ____________________ is a mathematical algorithm that produces a unique plain text for a given cipher text along with a decryption key. Explanation: Decryption Algorithm is a mathematical algorithm that produces a unique plain text for a given cipher text along with a decryption key. Inputs it takes are the cipher-text & the decryption key. Explanation: A set of all probable decryption keys are collectively termed as key space. A mathematical algorithm which produces a unique plain text for a given cipher text along with a decryption key is called a decryption algorithm. 12. Encryption-decryption in cryptosystem is done in ______ ways. Explanation: Cryptosystem which is also known as cipher system is the execution of cryptographic algorithms & techniques. Encryption-decryption in a cryptosystem is done in two ways. These are by Symmetric Key Encryption and by Asymmetric Key Encryption. 13. In _____________________ same keys are implemented for encrypting as well as decrypting the information. Explanation: Encryption-decryption in a cryptosystem is done in two ways. These are by Symmetric Key Encryption and by Asymmetric Key Encryption. In Symmetric Key Encryption, same keys are implemented for encrypting as well as decrypting the information. 14. In __________________ 2 different keys are implemented for encrypting as well as decrypting that particular information. Explanation: In Asymmetric Key Encryption 2 different keys are implemented for encrypting as well as decrypting that particular information. Inputs it takes are the plain text and 2 different key. 15. A set of all probable decryption keys are collectively termed as key space. Explanation: Decryption Algorithm is a mathematical algorithm that produces a unique plain text for a given cipher text along with a decryption key. A set of all probable decryption keys are collectively termed as key space. 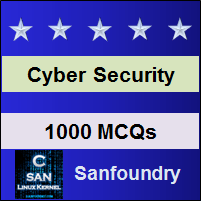 To practice all areas of Cyber Security Problems, here is complete set of 1000+ Multiple Choice Questions and Answers.